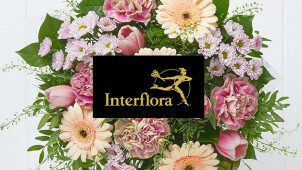 8% Off Orders at Interflora Show them how much you care with a bouquet of flowers specially arranged by florists. Exclusive £3 Gift Card with Orders Over £35 at Interflora By just spending £35 at Interflora, you'll receive a £3 digital gift card of your choice! Once your purchase has been verified we'll email you how to claim. £10 Off Orders Over £60 at Interflora Shop at Interflora for beautifully-arranged bouquets that cost even less with a discount code! 10% Off Orders at Interflora Get 10% off when ordering gifts or flowers from Interflora! 16% Student Discount at Interflora Here's a great discount from Interflora for our lucky students! £5 Off Orders Over £45 at Interflora Enjoy a £5 discount at Interflora when you spend £45. New Baby Flowers from £27 at Interflora If you know someone who is due or just given birth, let them know you're thinking of them! Hampers from £25 Plus Next Day Delivery at Interflora - Chocolate, Cheese, and Wine Treat someone special to a beautiful hamper from Interflora from just £25, with next day delivery available. Wedding Flowers from £10 at Interflora Be prepared for the big day, and choose from number of beautiful options at Interflora. Free Delivery on Selected Flowers at Interflora Don't pay more for delivery costs! Save with free delivery on selected flowers at Interflora. Spring Flowers from £25 at Interflora Get in the spring spirit, with a violet and pink bundle from Interflora. Birthday Flowers from £25 at Interflora Give someone a scent for the occasion in the form of a beautiful birthday bouquet from Interflora. Thanks to Interflora, every occasion can be taken care of with nothing but sheer delight and contentment. When words or keepsake gifts can’t say it, say it with flowers, because there’s nothing like a beautiful bloom or hand-made floral arrangement to make you or another smile. For your home, for your wedding or for another - Inteflora can cater for every type of milestone or day-to-day event. Now you can make it memorable with flowers, so next time you want to send a thank you note, birthday gift or if you want to outdo yourself with an anniversary treat or something fantastic for your grandparents - you’ll be able to grab yourself a beautiful bouquet at a showstopping price from Interflora. With quick delivery on an array of goods, here you will only find seasonal and quality goods that are put together in the hands of specialist florists. With ranges to personalise your goods, more luxury options, fairtrade goods and even designer flower boxes such as the Julien MacDonald or Vera Wang collections - everyone will be spoilt for choice at Interflora - changing the face of flowers all year long. How do I use my Interflora discount code? Click ‘Use This Code’ and then ‘Continue’ to complete the transaction. Be the first to know about the latest collections and exclusive offers by signing up to the Interflora newsletter. To see your order’s delivery status, simply enter your order number online here and click ‘Go’ to see its whereabouts. Does Interflora offer student discount? There isn't currently a student discount in place, however, keep checking vouchercloud for the latest offers and money-saving deals as well as the Special Offers' page on Interflora. How long will my flowers stay fresh? The Interflora promise ensures that your flowers will last for a beautiful 7 days. Click & Collect and other methods of delivery are also available, do check your specific florist and refer to the Ts&Cs. Call 0333 003 3588 or via email using the Contact Us page. For a company that’s the first name in flowers, choose Interflora. With birthdays and other exciting occasions always cropping up, you're sure to find yourself in need of a bunch or two at some point over the summer. Get it sorted with the best at Interflora and your flowers will always get there on time and without a petal out of place! Now you can access this great service for less with an Interflora discount code from vouchercloud. From roses and lilies to exotic orchids and more - here you can find flowers for everyone and every occasion. There is such a thing as an Interflora Delivery Pass which is a rewards' scheme to benefit all of Interflora's loyal customers.There are 2 types of passes available - Interflora Gold and Interflora Platinum - both with different perks including free delivery, quick services and more. Simply select the one that's right for you and you're in for great savings on beautiful flowers and their delivery. This could come in handy if you need a last minute gift! We like a bit of romance here at vouchercloud so when it comes to loved-up occasions like an anniversary or the wedding itself - with an Interflora promo code it's easy to save on beautiful gifts to make your other half smile. Red roses, fantastic freesias and perhaps even a little chocolate thrown in too could really make someone’s day this summer. If you're shopping for the big event, then Interflora wedding flowers are bound to impress your guests and help create the atmosphere you want - all without blowing that special budget.